The White House says Trump and Kenyatta also discussed ways to boost trade between their countries, as well as investment in Kenya and the broader East Africa region. WASHINGTON: President Donald Trump and Kenyan President Uhuru Kenyatta have discussed their mutual interest in overcoming terrorism. The White House says Trump expressed appreciation for Kenya's contributions to the African Union Mission in Somalia during a telephone call Tuesday with Kenyatta. Trump also recognized the sacrifices made by Kenyan troops in the fight against al-Shabaab, the Islamic extremist group that's taken hold in neighboring Somalia. Somalia is one of the six Muslim-majority countries affected by Trump's new ban on travel to the U.S. Part of the African Union Mission's mandate in Somalia is to help reduce the threat posed by al-Shabaab. President Donald Trump says he's "proud" to support the House GOP health care bill and hopes Congress will pass it very quickly. Trump had tweeted earlier Tuesday that the bill House lawmakers unveiled late Monday was "wonderful." Trump says the existing Obama-era health care law is "collapsing" and will implode if it isn't replaced. He says if that happens, consumers will be begging for help. But conservative groups and lawmakers are opposing the plan, saying it keeps too many elements of the law that became known as "Obamacare." Trump met at the White House with the group of House lawmakers who are tasked with rounding up votes for legislation. He says the health care plan will ensure access for all Americans. White House press secretary Sean Spicer says the Trump administration is weighing whether to make White House visitor logs public. President Barack Obama began putting out that information late in his first year in office, under pressure from government watchdog groups to make good on his campaign promise to be more open. As a candidate, President Donald Trump often railed against the "swamp" of Washington and insiders striking secret deals with politicians. Spicer was asked about the logs during Tuesday's briefing. "We are currently evaluating our procedures on that," he said. President Donald Trump plans to welcome Iraq Prime Minster Haider al-Abadi (HY'-dahr ahl ah-BAH'-dee) to the White House later this month. The White House says Trump will meet with al-Abadi in Washington during the week of March 20. The meeting comes after the Trump administration dropped Iraq from a revised temporary travel ban that applies to citizens of certain Muslim majority countries who apply for new visas. The White House said Iraq was no longer covered by the ban because the country provided additional security cooperation with the U.S.
President Donald Trump greeted the first wave of tourists to come through the White House since he assumed office. 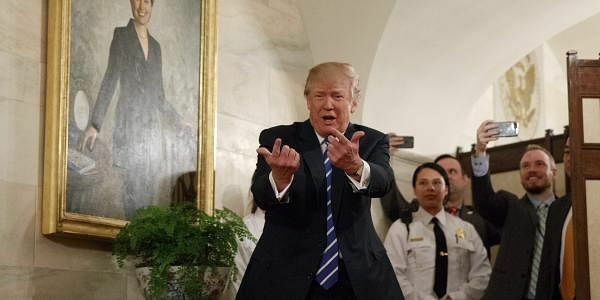 Trump welcomed a small crowd of visitors in the East Wing Tuesday, waving from behind a velvet rope as the crowd screamed, cheered and took photos. The president then pulled Jack Cornish, 10, from Birmingham, Ala., from the crowd and hugged him as the visitors and journalists looked on. The White House has been closed for tours since inauguration day. President Donald Trump says that Russia "ran over" President Barack Obama for years, calling it "weak!" Trump tweeted Tuesday that "For eight years Russia 'ran over' President Obama, got stronger and stronger, picked-off Crimea and added missiles. Weak!" He added the Twitter handle of "Fox & Friends" at the end — a show he has frequently cited as one of his favorites. Trump's latest criticism against his predecessor comes as senior members of his administration face questions about their contact with the Russian government. This weekend, Trump used Twitter to accuse Obama of ordering wiretaps on his phones but offered no proof to back the claim. President Donald Trump says "122 vicious prisoners" released by the Obama administration from Guantanamo Bay, Cuba "have returned to the battlefield." Trump didn't cite where he got the statistic in his Tuesday tweet, calling their release, "another terrible decision!" On Monday, U.S. airstrikes against an al-Qaida-linked group in Yemen killed a former detainee who was released from the prison in 2009 despite earlier recommendations that he remain in custody because he was considered a "high threat" to America and its allies. At its peak, the Guantanamo prison held nearly 680 detainees. It was down to 242 when President Barack Obama took office in 2009 and he got that number down to just a few dozen. Obama called the prison was a waste of money and a recruiting tool for extremists.